I got diverted by a couple of family responsibilities, some business travel to the west coast, putting up a 160 meter band Windom off-center fed dipole antenna for some ham radio stuff. Now that summer is here, I'm back at the Studebaker projects, looking forward to the upcoming St. Louis Studebaker meet in August. Yes, Spinneyhill, the longitudinal rigidity needs to be addressed. I looked carefully at the front mount that was used in the 1929-33 Commander and Dictator 8 engines. That plate seems to be stamped from a 1/4" thick steel plate. It is mostly flat but was folded at the edges to provide the front-back stiffness. I think I can extend the edges of the plate and fold them in a brake, then weld them to form a kind of ring around the plate. Still, the photos from 1934 show a flat plate in front, though it might be as thick as 3/8". I can do that as long as the front cover can move forward that far and not contact the harmonic balancer. I've been staring at the shrinker/stretcher tools at Harbor Freight. I need to buy one, and the foot-pedal operated ones on a stand are really the thing to have. That and a few more pieces for the oxy-acetylene aluminum welding rig and I can start to fabricate some body pieces from the 0.050" thick, type 3003 aluminum sheet that I have. Before you pull the trigger on cheapy Chinese stuff at Harbor Freight, check out Eastwood's selection. It will be more money, but I think you'll be happier with the quality in the end. Yes, you are probably right about the quality issues. On the other hand, there is an HF store about 10 minutes away from my house and a Tractor Supply place within 15 minutes. It's very easy to drop in and look/buy while I'm out running other errands. Nothing like instant gratification! I figure if I can get the primary task done with the HF stuff before it breaks then I'm doing OK. I agree that any tool that needs to live through a number of tasks ought to be more durable and better quality. But, remember that almost anything we buy now that is a metal part or tool probably comes from China anyway - a pity, but that's the reality. I did buy a U.S.-made press brake kit from Swag Off Road for my HF 12-ton hydraulic press and found that it was pretty good and a fair price. We don't have Harbor Freight up here, but a lot of the same quality merchandise ends up in our Princess Auto stores. There are some items that I have had good luck with. 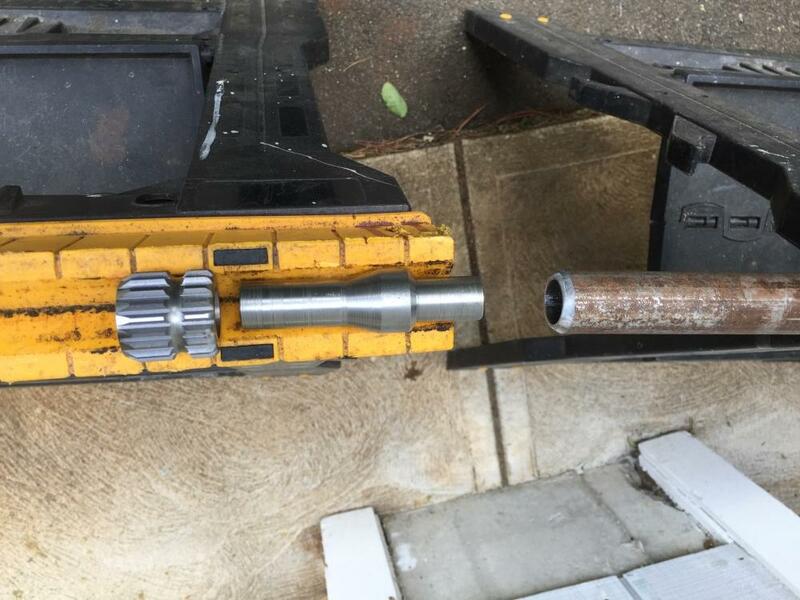 The hydraulic jacks that you mention (hydraulic cylinders in general) would be one of them, air powered die grinders would be another. You are correct in that a lot of items on our shelves now, even from name brand companies, is being made in China. Even companies like Victor and Snap-On are outsourcing, but that doesn't mean that the quality is the same as HF. It's unfortunate, but the quality is still generally better from a name brand company. If the bead roller does that job you will be money ahead, but if it doesn't you just lost the down payment on a much better tool. I'm still guilty of perusing those shelves too (got a great sale on automotive wiring next week) but I'm becoming much more selective on what I will buy there. I have/am enjoying your project. My mother's family had at one time 3-generations working in the Studie factory. One of her brothers, SR RAY MILLER had in his car museum several Studie's. At this time I am building a 32" long model of the number 2 1925 Miller car. 1-5 scale, I have wonderful photo's of the car taken by Peter Harholtz, and have made contact with metal man Jerry Weeks here in Indy as he rebuilt the car a few years ago. I am going to visit his shop soon, as he had detailed photo's/drawings for me to review. My piece will be of solid walnut, and copper, plus a 48" section of a board track. This is my ninth large scale model, my last was the GOOGLE RAYMOND LOWEY Locomotive, it recently won best of show in a juried art contest/show. I might add, being a straight Buick fan, mine will have 8-exhuast header pipe on the left side. You would also enjoy his book about his father, Russ Snowberger, who drove many Studebaker-powered Indy cars in the 1920's and 1930's. The book is called "Russ Snowberger" and is available from the Indy Speedway Museum shop. It's a great "coffee table" book, many photos of Indy cars from the 1920's through 1960's. Well worth the price. Thanks, I have one of his cars, and may buy the book. I have talked with him a couple times. My brother had 6 of his cars, all very nice pieces, he passed away, so daughter has them. I have a lot of stick time in the 34 car when Brooks was alive ....... Road raced it many many miles. In proper trim the car is FIERCE! And has no brakes. it was fun pitching the car to slow it. About Gary's car......... The Brooks Steven car had original firewall and all the identity plaques ..... A Studebaker engineer made #34 into a street car. as I recall the conversion consisted of adding fenders. 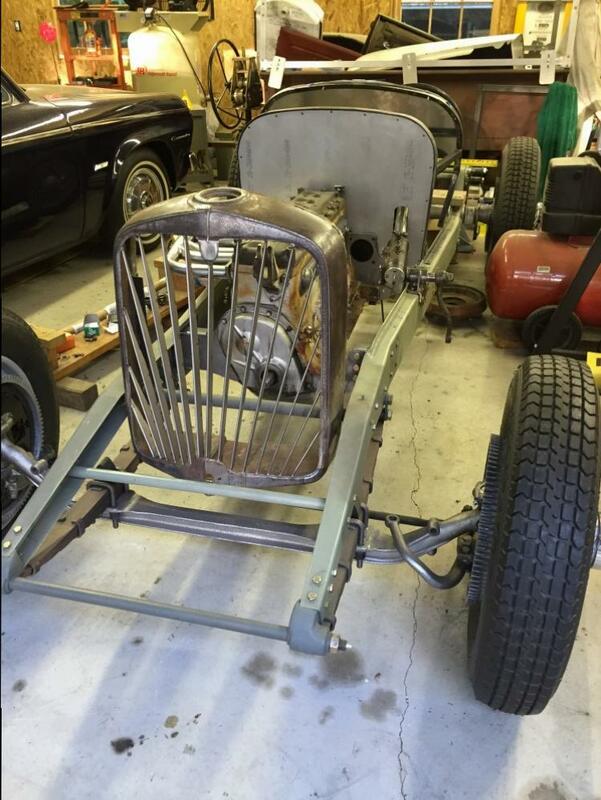 The car has the original engine, frame, Firewall. So what "body Parts"did Gary start with? At first he told me he had the car. Then I told him I'd driven the car at speed....... The he said Brook;s car was a re-body. Why would someone toss the original body and not the firewall? For GOD sake please make sure it will stop! All of the Studebaker Indy cars went through a lot over the years. It's been 85 years since #37 was built and 84 years for the others. They have been raced and crashed, modified and restored, but they continue to exist. 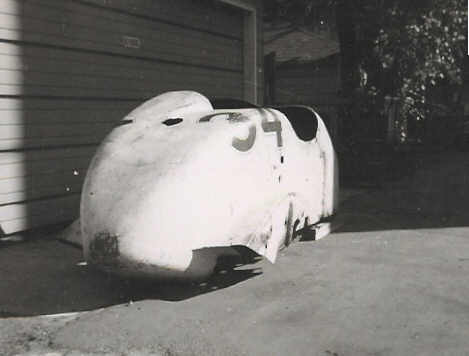 Car #34 in 1933 had one of the wind-tunnel designed bodies. I'm not sure what the body was that was on the car when it got converted to a sports car, but it apparently was not the body used on that car in the 1933 race. 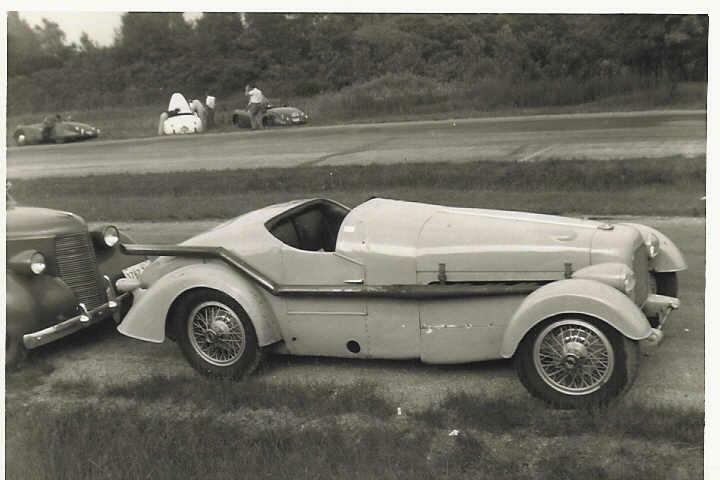 It could have been one of the other 1933 bodies because several of the cars reclaimed their 1932-style bodies or it could have been a body fabricated from scratch. 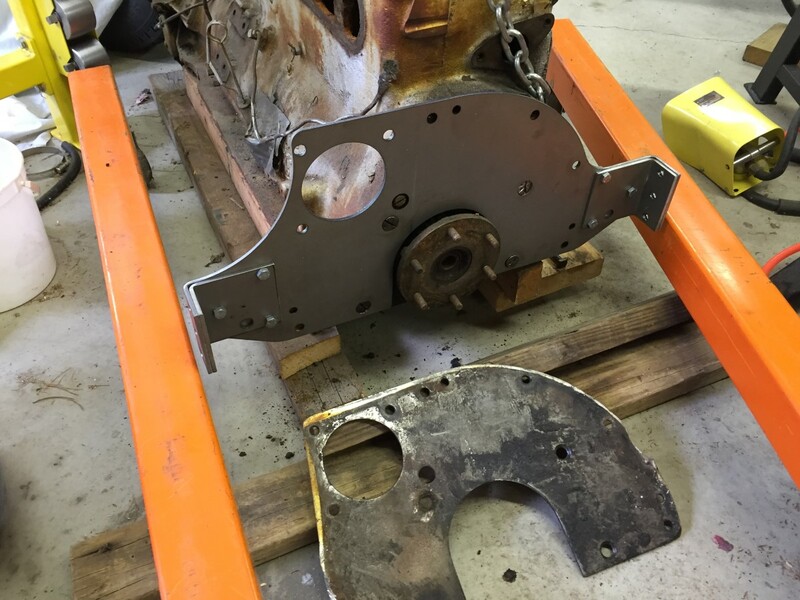 The chassis and radiator shell were found in Wisconsin about 1961 without any body. 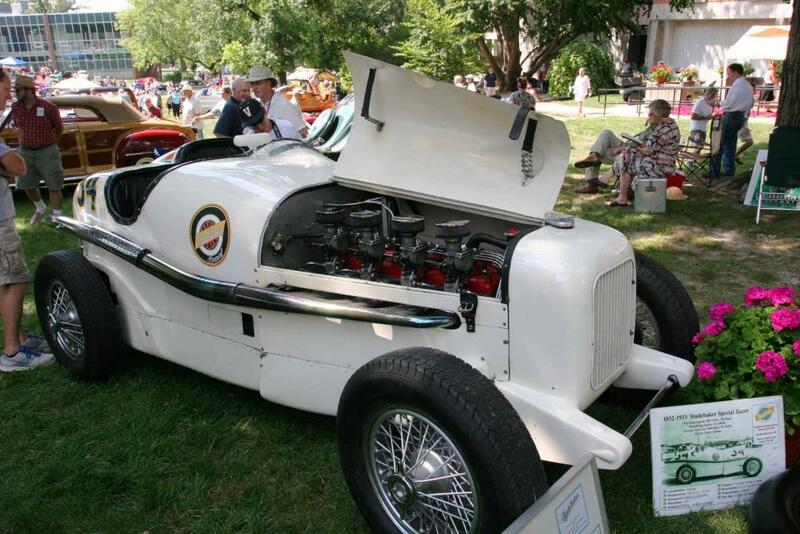 The chassis was bought by Brooks Stevens who commissioned the Besasie Engineering shop to fabricate a copy of the 1933 body. 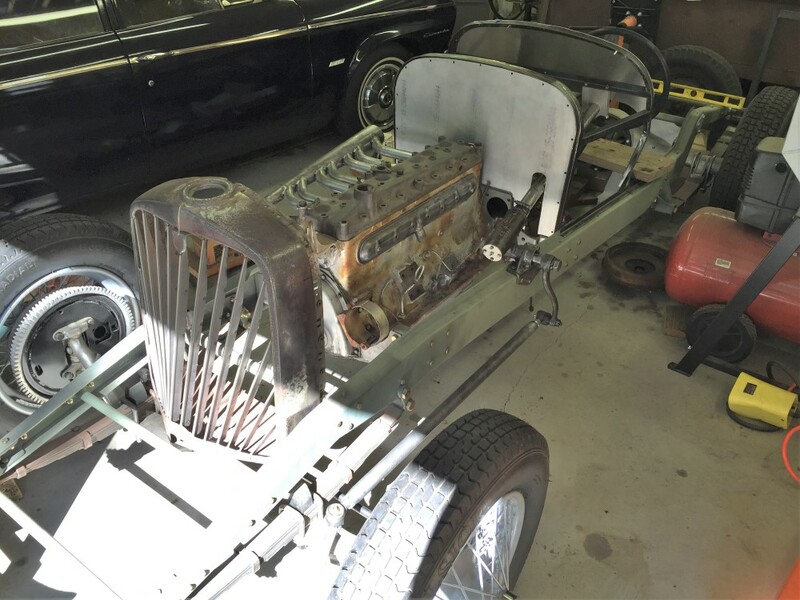 While this work was going on, the original 1933 body for #34 turned up in a garage in Chicago and was subsequently sold to a guy in California where it still lives without being attached to any chassis. The aluminum bodies are just skins. The tail section is hollow and self supporting. The forward section comes free of some underlying angle-iron framework to which the aluminum plate firewall is attached. So, it's not a surprise that the firewall stayed with the #34 chassis. While #34 may have retained for some time the cable-operated 12" brakes with stamped steel drums from the early '30s Dictators, it is now equipped with 12"x2" hydraulic brakes (Dexter trailer brakes) and cast-iron drums as used on 1960s full-size Buicks. The current engine is a larger-displacement Pierce-Arrow block, nearly identical to the 337 cu in Studebaker blocks. The car goes fast and stops well. I had a very nice ride in this car at something over 100 mph. The car is currently owned and driven by August Grasis III. I'll have PLENTY of stopping power with front brakes from a 1963 Buick Riviera: 12" x 2.25" with aluminum 90-fin drums. I've also got the Riviera finned drums in back with 12"x2" shoes and backing plates from a '60s Buick sedan. See my post #48 back a few pages for some photos. I started with nothing but a few photos, the Ray Kuns magazine article from 1935, and a lot of advice and free access to #37 for measurements from Bob Valpey. I have acquired a wooden body buck used in the early 1980s to fabricate a new tail section for #37 and a pile of useful drawings and photos from people who restored these cars. But, it's still slow going. Satisfying to me, but still slow. You have provides the info I needed to fill in one more gap. I am very happy that Mr Kuns owns the car now and has sorted the problems. My interest in the cars really started with the story in "OLD CARS" They are wonderful things. The Indy car project became a neglected child due to a bunch of family obligations and house projects, but I'm happily back at work in the garage now. 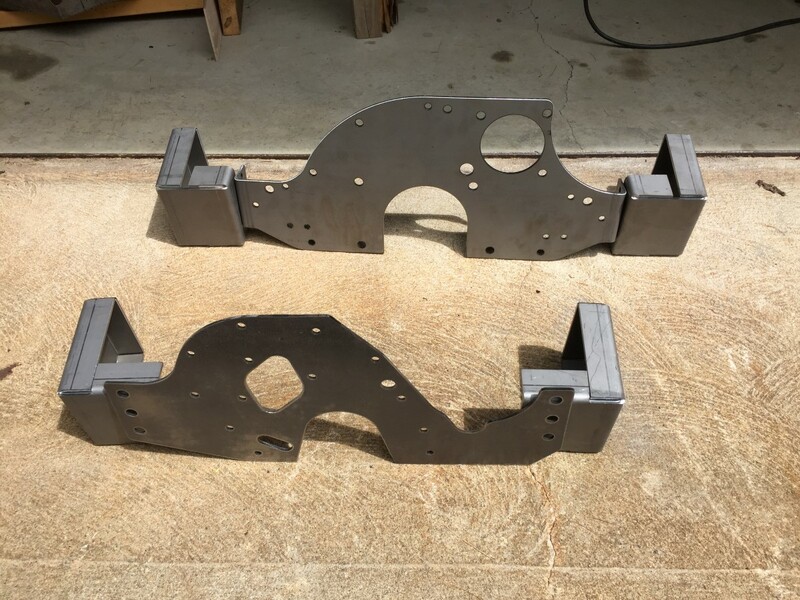 My preliminary design for some cross members/engine mounts using the original front engine plate assembly on the 1937 Studebaker block turned out to be too cumbersome, ugly, and it didn't fit well. I went back to the original 1934 Studebaker photos for the engines they were preparing for Indy and copied those plates. Of course, there were about 20 holes in each plate that had to be precisely located, so I ordered up blueprints of the original engine block and plate drawings from the Studebaker National Museum - what a fantastic service! Scaling from the old photos, I copied the plates pretty faithfully in my CAD system and designed short, stiff mounts to bolt to the frame rails. The combination allows the engine to be easily removed and re-installed. My local metal fabrication shop laser cut the plates and mounts (3/16" thick) and bent them as needed. The mounts are made like boxes, and I welded the seams for extra strength. 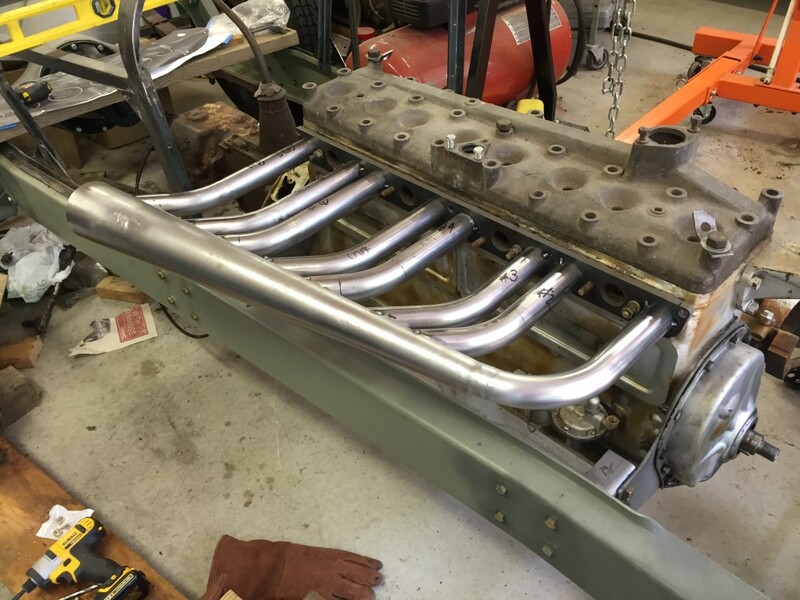 The real challenge was to locate the mounts on the frame rails in the exact front/back and up/down positions so that the engine would drop into place exactly level and all the bolt holes would line up. I sweated bullets over this, but it did finally come together. 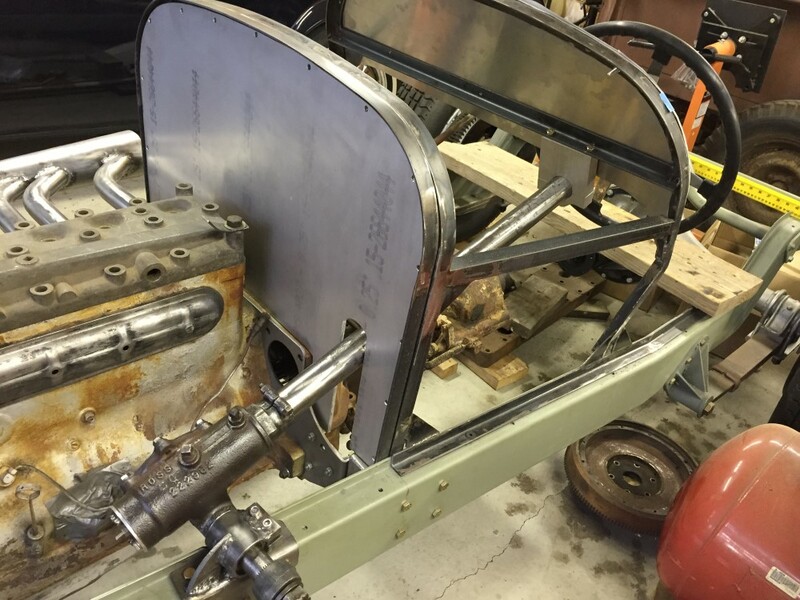 The next steps are fabrication of the exhaust manifold and mounting the steering box. 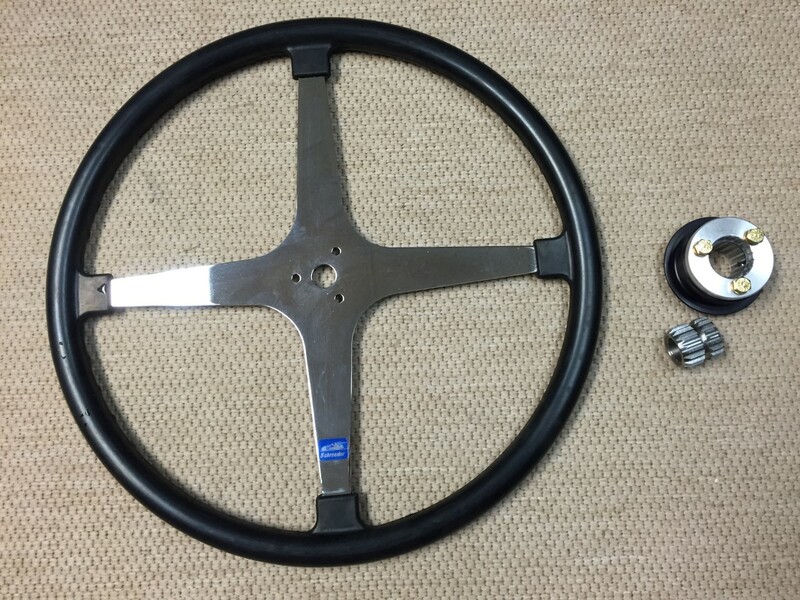 I bought a 17" steering wheel from Schroeder Steering with a squeeze-lock hub so that the wheel can be removed to get into the car. The space for the driver and riding mechanic/passenger is really tight, as the body will only be about 36" wide. The passenger actually sits about 5 inches farther back than the driver. The first picture below shows the cross members I made that I didn't use. The new and old rear engine plates. At last! 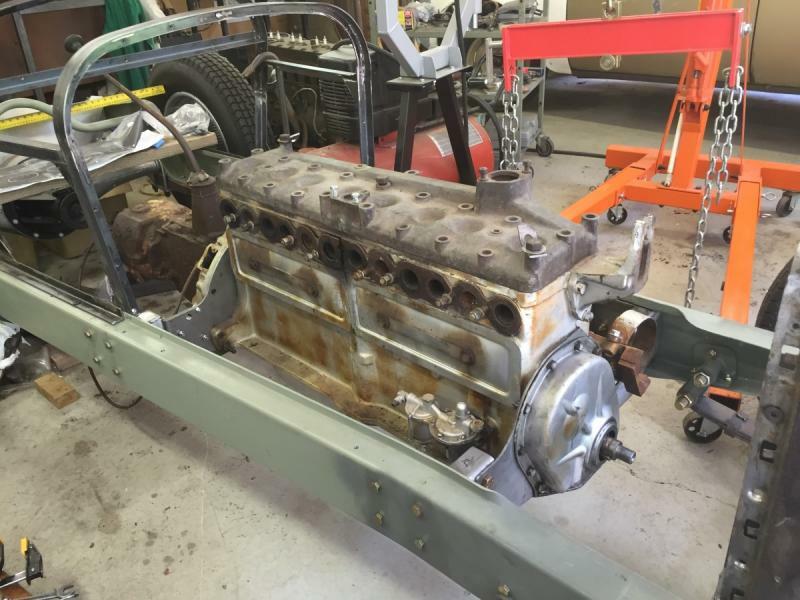 The engine bolted into the chassis and transmission in place. The drive shaft will be very short. The mounts look very good; perfectly fit for purpose and no weight penalty to boot. Xclnt. I got the hard work done on the exhaust manifold today. 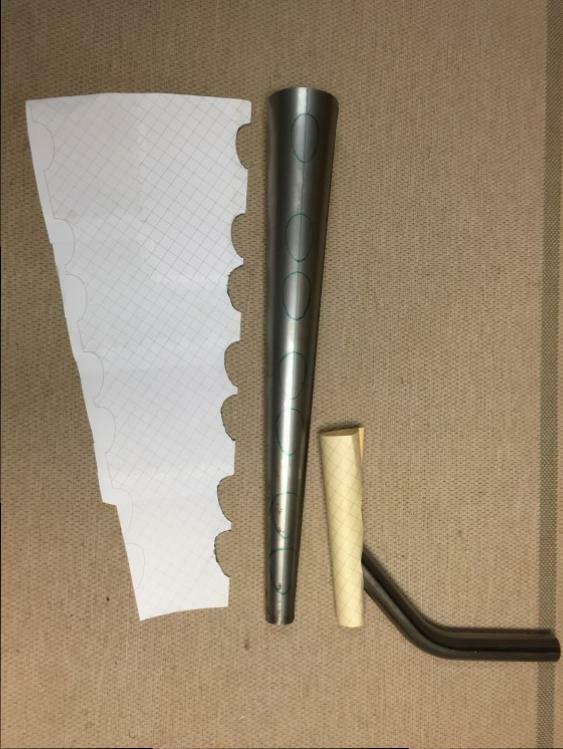 I bought a bunch of 1.5" diameter x.049" wall mild steel mandrel-bent 45° and 90° elbows and a 1.5"x3.75"x28" long megaphone from SPDexhaust.com. The flange was 3/8" thick steel, water-jet cut by my local metal shop. I laid out the design for the assembly on my CAD system. I placed the elbows where I wanted them in the CAD design, then "subtracted" the elbows from the megaphone to get the shape of the opening for the tube penetrations. While a round tube intersecting a flat plate needs an elliptical hole, a 45° tube intersecting a cone tilted at a 10° angle needs a more egg-shaped hole - and each hole is a different size when there are 8 intersecting tubes. 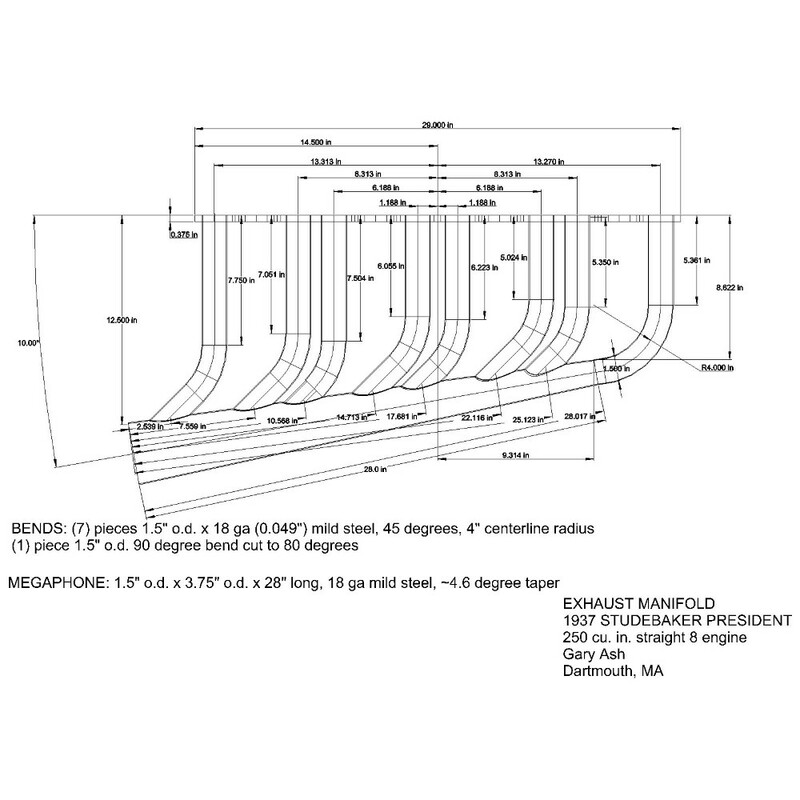 I was able to have the CAD system "unfold" the megaphone cone into a flat pattern so I could trace the hole shapes onto the steel megaphone. 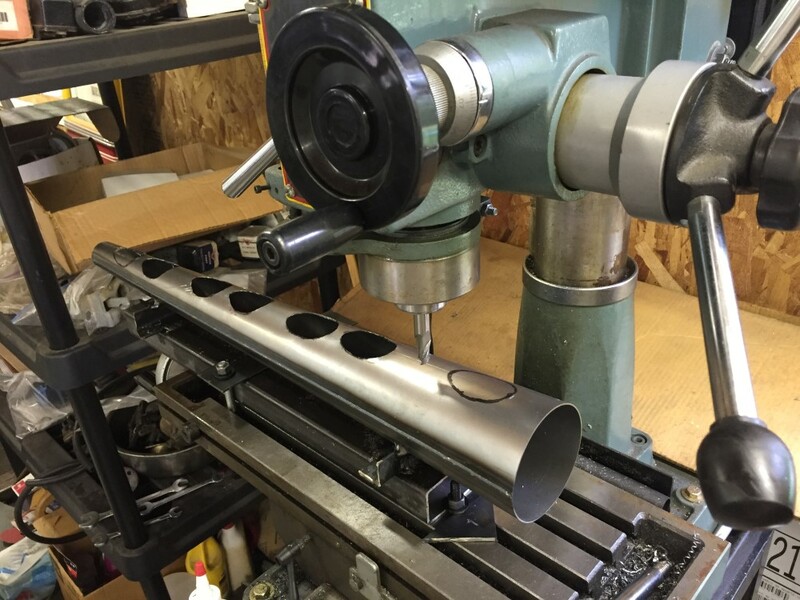 My buddy at the local machine shop said he couldn't figure out how to cut the holes because he had no way to grab the megaphone and prevent it from flying out of the milling machine. I took the parts home and tack welded the megaphone to a piece of 1.5"x3" rectangular steel tube [leftovers from my aborted attempt at engine cross members]. Since I have a small milling machine and the megaphone was now firmly attached to a sturdy object, I figured I might as well mill it myself. I manually fed the table while eyeballing the cutter's approach to my traced lines, then finished the holes with a die grinder. Some scraps of 2x4 and 2x6 wood were used to make a fixture to align the cone and flange, with a shallow pocket to hold the big end of the megaphone. 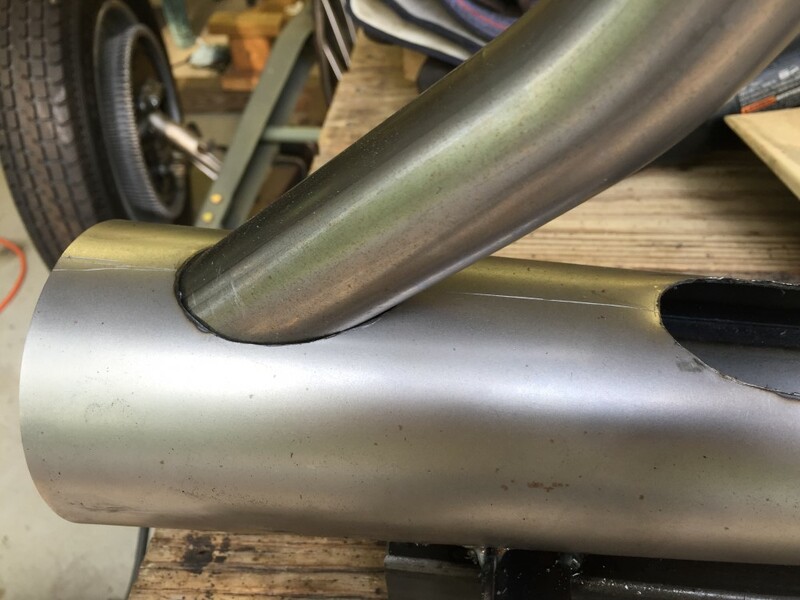 I welded the 80° bend to the small end of the cone to set the overall alignment, then cut and trimmed the other elbows to fit. I test fit each elbow individually and used the die grinder on the holes in the megaphone holes to gain enough wiggle to get alignment with the flange. With one end in the flange and the other end poked into the megaphone, I scribed a line around the elbows at the penetration point, then trimmed in ends of the tube about 1/8" longer so that there wouldn't be too much sticking into the inside of the megaphone. With a little difficulty, like juggling a dozen things at once, I managed to get each of the other seven tubes into the flange and into the megaphone holes. A rubber mallet was useful to persuade the elbows into the right rotational alignment, as well as proper penetration of the flange and megaphone. I quickly put a bunch of tack welds on each end of the elbows to hold everything in place. I even tried the assembly on the engine block to be sure it cleared the chassis and firewall. One of the photos shows the inside of the megaphone with just a little of each tube poking through. Now I just have to spend a bunch of hours slowly MIG welding a few inches at a time, then letting things cool, to prevent stress buildup. I'm pretty happy with the results. This was the assembly that I had been quoted as much as $5000 to build. The elbows and megaphone cost about $250 and the flange was about another $100. Oh boy, is that impressive or what? Truly amazing. You are a man of great ingenuity! Looking good, I'm guessing you are enjoying the THOUGHT process. I know when building my modified 41 Buick limited I really enjoyed the thought process. I just finished building a 1/5th scale of the 1925 Miller Indy car out of solid walnut and copper. Piece took over 1100 hours, and is on display in a ADVENTURES IN WOOD show/contest as I write, not a kit, no drawings, no patterns, just from looking at pictures. 30" long. I'm just starting on a 1/4th scale of the 1910 Buick bug, it will be my most detailed piece. 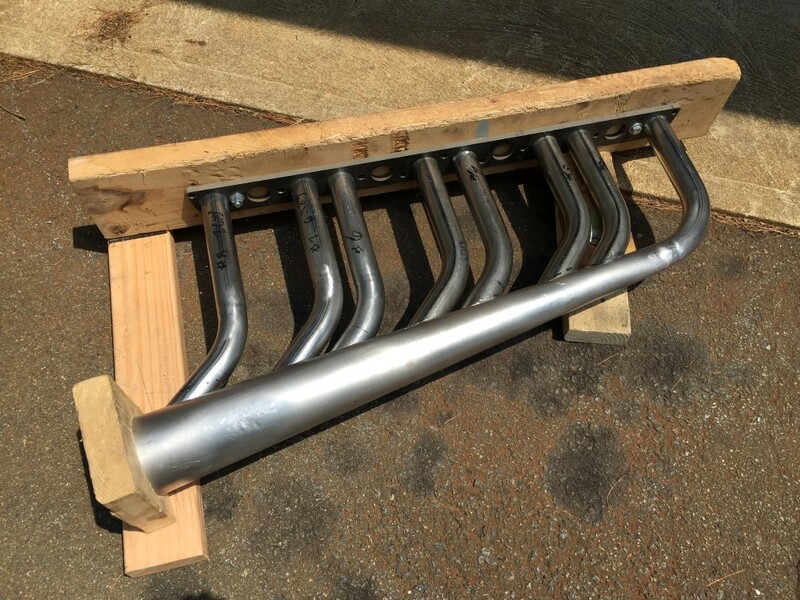 What coating will be on the finished headers? In this case, it was chew out the basic shape with the end mill on the manual X-Y table without crossing over the tracing lines, then finish up with a die grinder to the edge of the traced lines. It's very low tech, but fast enough. In the end, I had to die grind a bit more to allow the elbows to maneuver a little out the calculated positions in order to get the tubes into the flange and the megaphone. Allowing a gap of about 0.030" is OK for welding while giving a little motion freedom. A plasma cutter is great, but it's another $700 item that I can't use often enough to justify, and a hand-held torch wouldn't be more accurate. Yes, I do need to put some kind of treatment on the manifold. I'd like to blacken it with some kind of rub-on material. I'm OK with re-doing it every 6-12 months as I won't be driving the car every day. I think a porcelain treatment would be overkill. Any recommendations? You could FLAT FINISH IN POWDER COAT. A tool and die maker in the 60's taught me, scribe your line, but NEVER cut down the center of it, leave it showing so you can dress up to it. As you have stated, I know you know this, hehe. I don't use my plasma cutter much, did build a rolling water catch cart for it. I like your holding jig for the header system, what works, works, huh. Your build is one of those where it's best NOT to look at the entire process, but ONE STEP AT A TIME. Had I thought of all I had to do in the 1100 hour model build, well, I might have given up. I'm like a turtle, slow but steady, I also like to STARE, kind of like an owl, fast eyes see little. If ceramic coatings look too modern for you, you could consider powder coating as suggested, or cheaper yet would be the spray bombs of heat resistant paint. With the work you put into that and how nicely it came out, I would think powder coat would be a minimum. I like the motor mounts as well... the first attempt was good, but these look much better. The steering box is proving to be a lot of work. 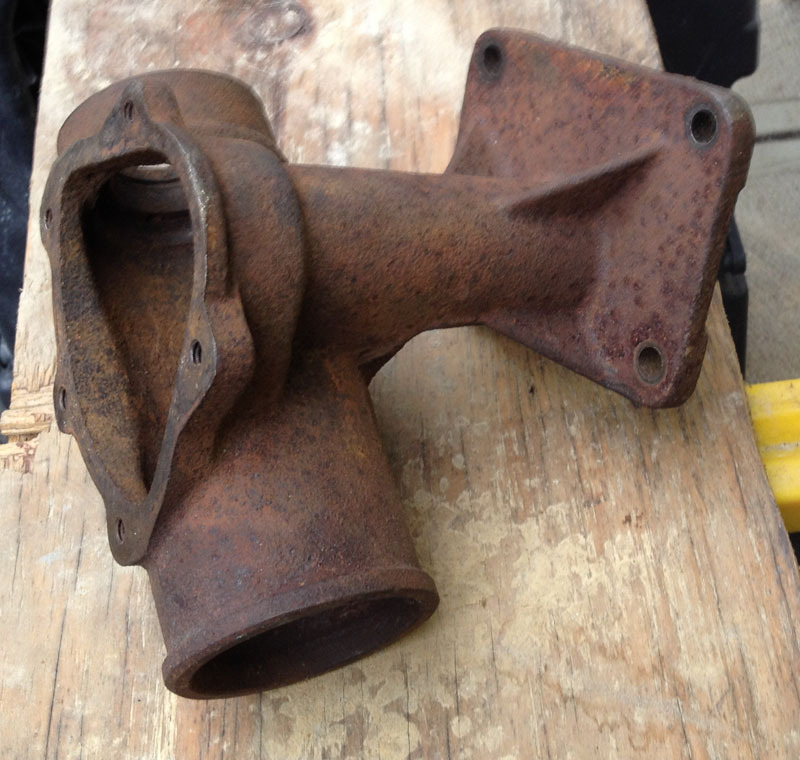 I actually have two 1929 Studebaker President steering boxes that I'm working with. The first came with the remains of the chassis I bought some years ago, the second I found at a local NOS parts dealer, but they are the same boxes. The first one had spent 30-50 years out in a field and had a lot of rust. The second came out of a wrecked car, but hadn't lived in the rain for so long. They are both Ross "cam-and-lever" boxes with one pin and a three-turn worm. While the first box had more rust, the pin on the lever arm had much less wear. The worm and shaft from the second box were better, as was the cover tube (1.75" o.d. x .039 wall). 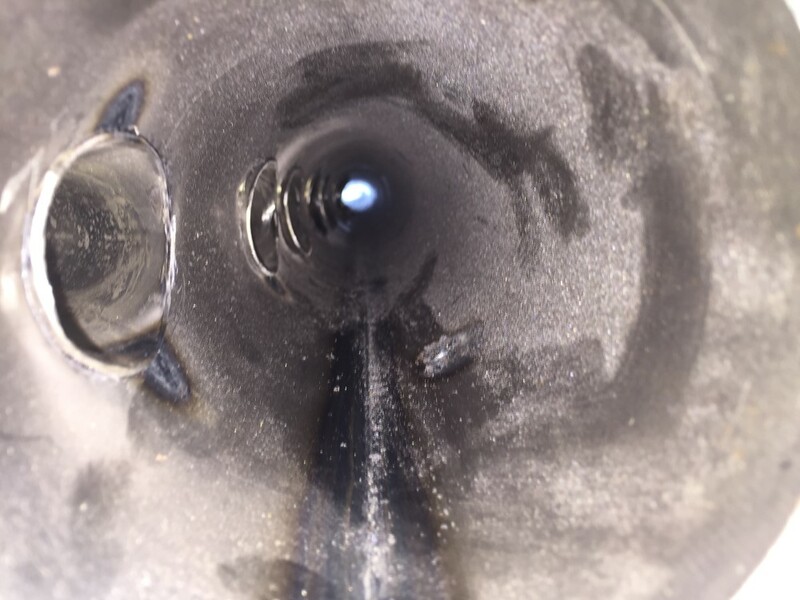 After checking how much of the 1" diameter x .188" wall tube for the shaft I needed, I cut off the excess and ground a weld bevel on the end of the shaft. I bought a 4-spoke sprint car-style wheel from Schroeder Steering in California with a pop-off splined hub. 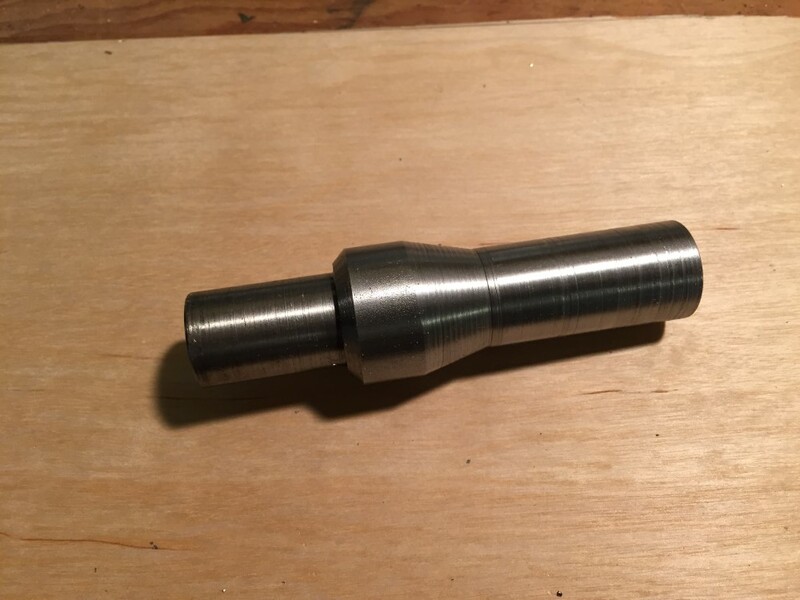 The largest hub available had a 3/4" i.d., so I had to machine an adapter from a piece of 1" 1018 cold-rolled steel bar stock. Surprisingly, the Harbor Freight 7"x10" lathe handled this with few problems. I think it's because I bought some decent lathe bits with high-tech inserts that really peel off the steel chips. The adapter slipped inside the steering shaft tube and also inside the Schroeder hub with only a few thousandths clearance. As the coupling of the steering wheel to the shaft is critical in the safety realm, I was very careful in the weld preps and the welding. I think I got it right. In the end, I got the splined coupler welded to the adapter and the adapter welded to the shaft. Now the Schroeder wheel slips onto the splined hub and locks in place with three spring-loaded balls. The hub has a flange that needs to be squeezed to release the wheel from the splined hub. The tight fit in the driver's seat necessitates the use of a removable steering wheel. So, the worst of the cutting and welding is done on the box itself. 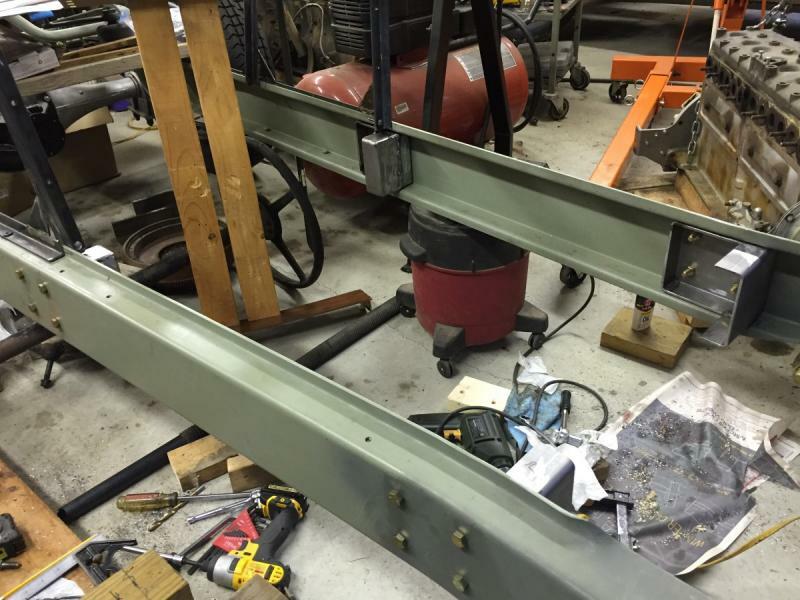 Now I need to weld up the mount to the chassis and machine the hanger for the column. Because the splined hub is on the shaft, I'll have to make a split bushing from Nylon 6/6 with molybdenum disulfide blended in and secure it inside the column tube once the shaft is inserted in the tube. 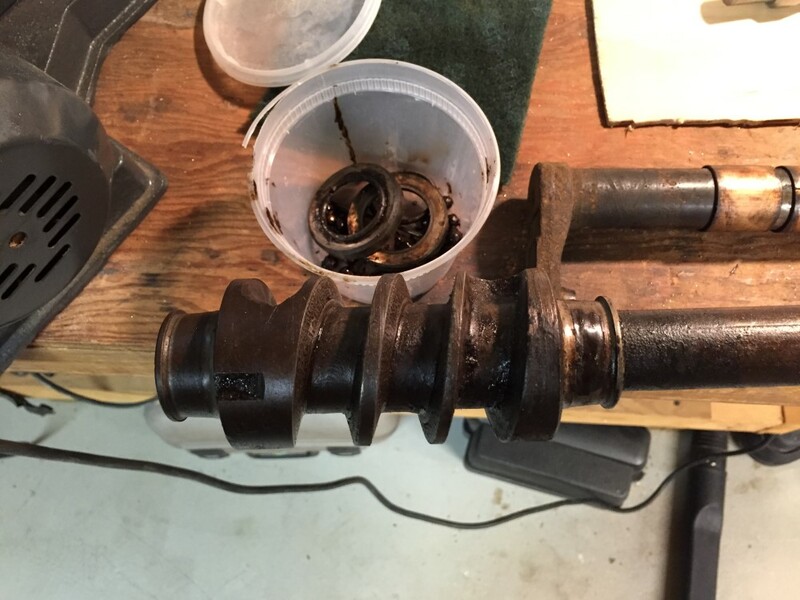 The original bushing seemed to be a ring of linen phenolic with rubber molded on the outside, but it was stuck to the shaft and the column tube after 87 years. I hope my new design works! YOU are going to fool around long enough to have for YOURSELF a Stude Indy car. After way too much time spent on difficult details, the steering system is almost done. I got the shaft and worm back in the box casting after replacing the bearing balls at each end. The cups from the 2nd box were good enough to use. 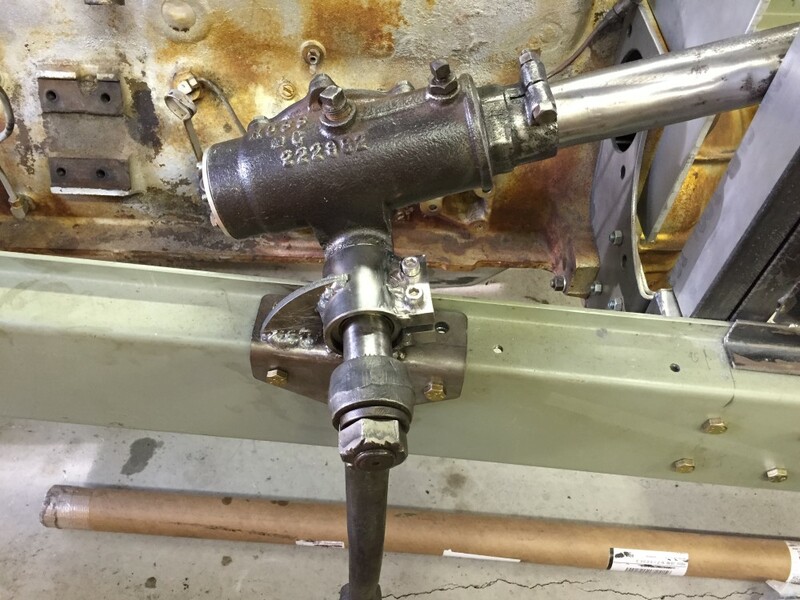 While Ross boxes from the 1950s and later used shims on the shaft flange to adjust the play and bearing preload, this old 1929 box used a big screw-in pipe fitting arrangement. 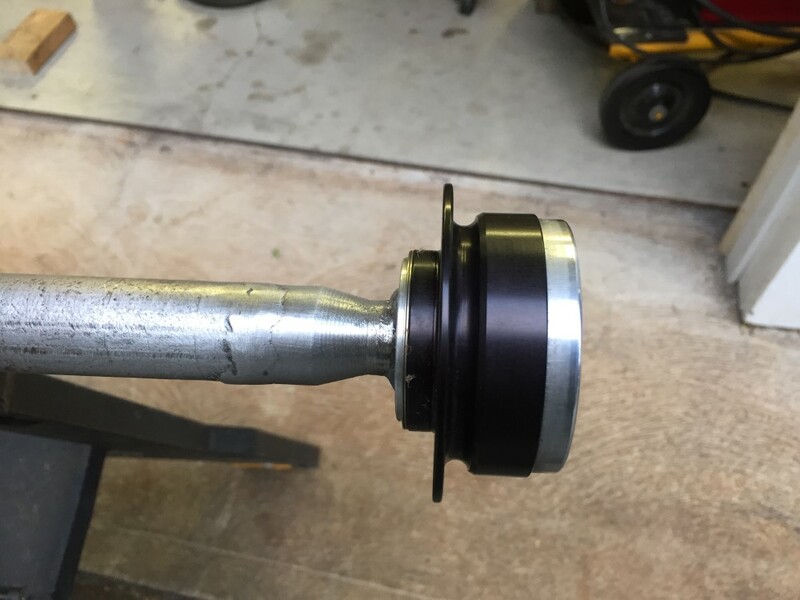 Of course, the fitting no longer wanted to screw in smoothly, so I had to chuck up the part in my Harbor Freight 7"x10" toy lathe and recut the male threads which were about a 2"-16tpi thread. I screwed the fitting in until I had almost zero motion along the shaft, then gave it another 1/6th of a turn to preload the bearings a bit. I had originally removed the bronze bushings for the lever arm to the Pitman, thinking I could easily find new bushings, but I wound up pressing them back in. 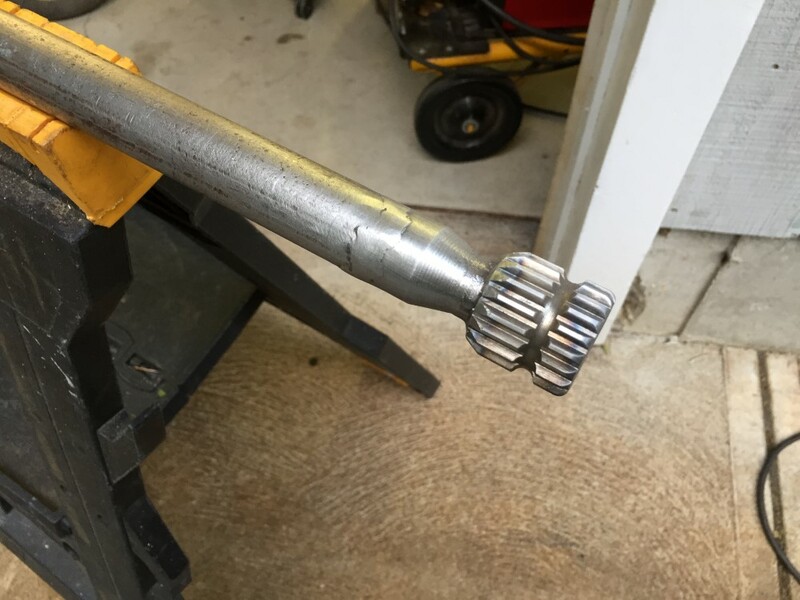 Of course, the shaft for the lever arm didn't want to fit anymore, so I had to hand-ream the 1.25" bore until the shaft went in and moved smoothly. Only afterwards did I find something on-line saying to finish off the reaming with a brake cylinder hone to smooth things out. Next time! Because the worm came from the 2nd box and all the rest was from the original box, I had to play with the cover shims to take out all the slack. In the midst of this, I noticed that there were gaps between the cover and main box flange, perhaps .010"-.020" because the cover wasn't flat. As the cover was a piece of stamped steel plate, I put it in the hydraulic press and pressed it flatter, not perfect but better. I'll use some blue RTV gasket sealer on the flanges and shims before I close it up for good in order to prevent big leaks, but it has to be a very thin coating so I don't change the shaft play. I was looking for about .005-.010" in-out motion so the pin would be snug in the worm but not rubbing too hard. The worm, lever, and bearings got a coat of regular chassis grease, but I'll fill the box with semi-fluid grease with an NLGI rating of 00 (about like applesauce) so it doesn't leak out but will slowly flow in the box to keep everything coated. I got the grease at Tractor Supply Co. as "cotton picker spindle grease", though no cotton has ever been grown in Massachusetts as far as I know. Then I welded up the mount using 1/4" thick steel plate. I had sliced off the original mounting plate that had been cast into the box and turned the housing to fit into a short piece of ~2" dia. steel thick-wall tube. I sliced a groove through the wall of the tube, welded on a couple of blocks to make a clamp, and drilled and tapped a couple of holes. Perhaps I erred on the side of "more weld bead is better", so I had to use a couple of socket head cap screws in the clamp - maybe not period correct, but very functional and safe. 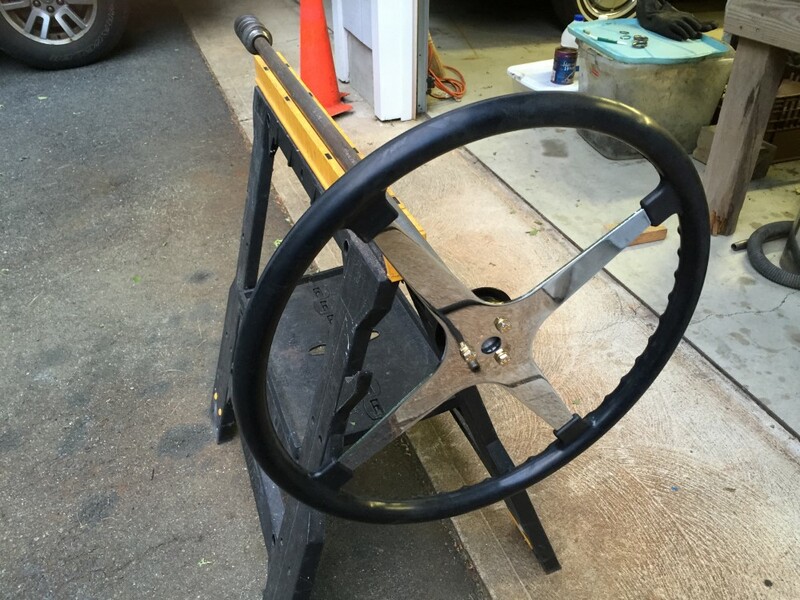 The clamp mechanism was to allow the steering wheel to be raised or lowered to suit different sized drivers. I trimmed the 1.75" o.d. housing tube to length and installed my Nylon 6/6 split bushing to keep the 1" o.d. shaft centered in the tube. The steering wheel turns easily without any slop. The 1/4" thick aluminum firewall received it's final major cut to let the shaft pass though. 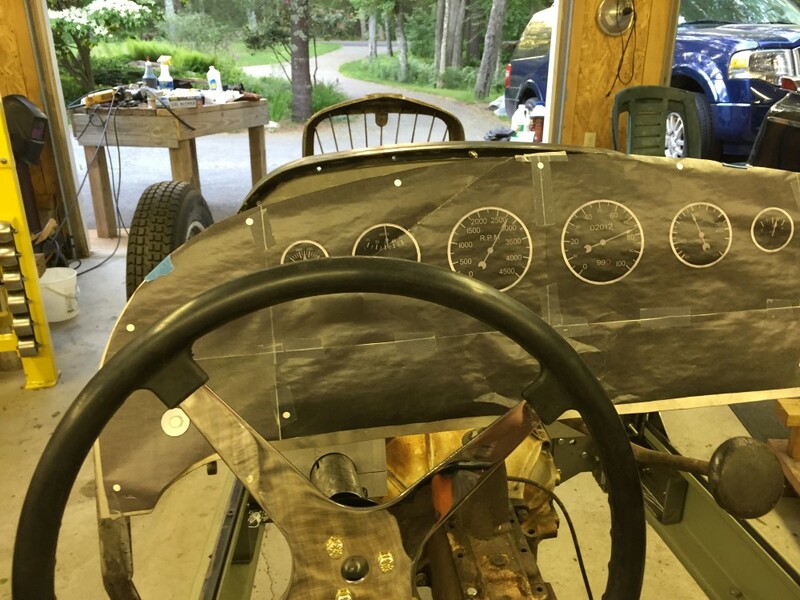 After all of the cutting, trimming, and fitting, I was happy that the firewall opening for the tube was within 1/8th inch of the location of the opening in the firewall of the car built in 1931. I have a tracing of the original 1931 firewall as a guide. The steering only needs the reach rod to be fabricated. I have the tube here and the weld fittings with left hand threads. I did order the and receive the rod ends but I put them away so safely that I could find them after more than 24 hours of searching the house, shed, garage, attic, basement, etc. 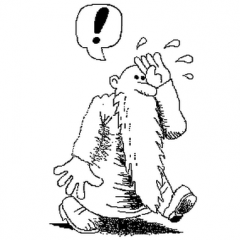 Bad senior moment! A new set is ordered, but I'm sure to find the first set as soon as I weld up the reach rod. The chassis is looking more like a real car every day. If you are at all worried about the weld in the steering column you could get it X-rayed. 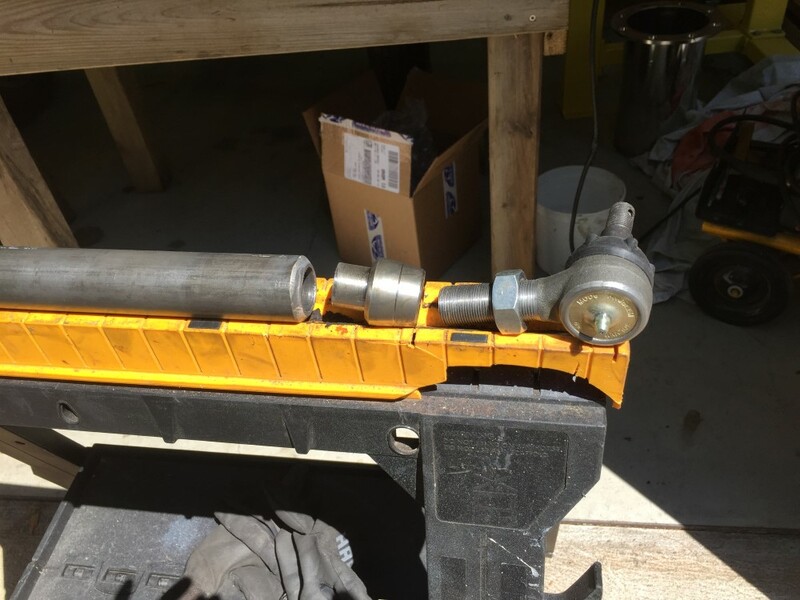 I never did find the original set of tie rod ends I ordered for the drag link/reach rod, but the 2nd set arrived and I set to work assembling the rod. As I wanted to get the length right, I tried aligning the front wheels for zero toe-in. The tires are Coker Excelsior radials that look like old bias plies, and Milliken and Milliken's "Race Car Vehicle Dynamics" book suggests zero toe-in for race cars anyway. Incidentally, they also say that Ackerman geometry isn't important for race cars, only for low speed turns to avoid tire scrub. Apparently, the Ackerman geometry was designed in the mid-1800s so that fancy carriages wouldn't mess up gravel driveways. 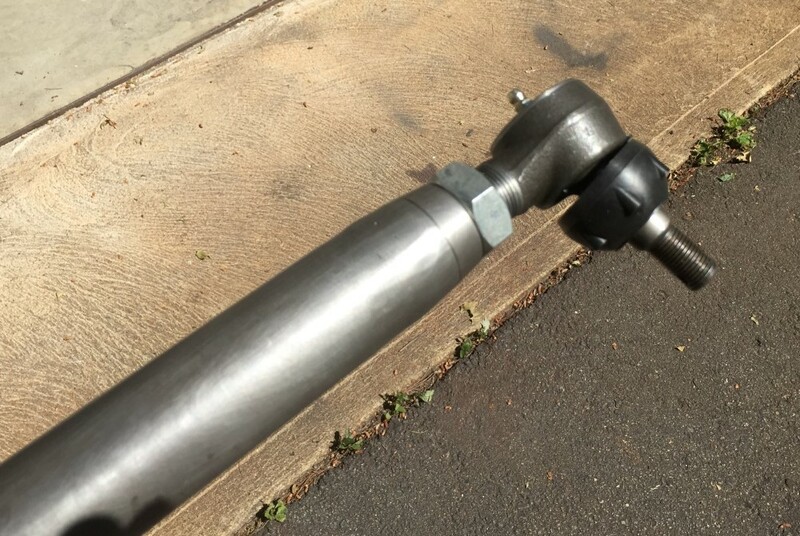 Anyway, The tie rod that I took from a 1929 Studebaker Dictator had the right kind of ends to fit my steering arms, but couldn't be adjusted short enough to align the wheels. My local industrial supply house came up with 3/4-16 right hand die, 2" in diameter, on Friday afternoon so the plan was to add about 10 threads to the right-hand threaded rod end. I neglected the fact that I didn't have a die stock that would hold the die, but thought I could just use a big pipe wrench to cut the 10 threads. Hah! That die is so hard, the pipe wrench only slipped around the outside. As I couldn't find a proper die stock on Saturday morning within 25 miles, I wound up fabricating one from 1/2-inch square steel bar and an old piece of black steel water pipe. It held the die just fine and I cut the threads, then sawed 3/4" off the end of the rod. Now the wheels adjusted properly. 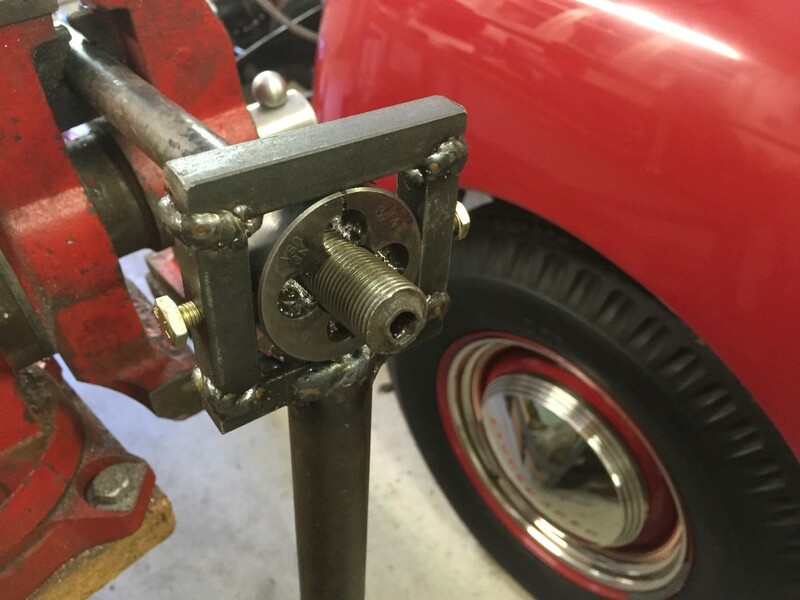 The threaded inserts and jam nuts I got from Extreme Custom Parts are usually for off-road 4x4 Jeeps, etc. They also supplied the 1.5" o.d. x 1" i.d. steel tube. I'm not planning on going off-road in this car, but the drag link will stand up to anything! The tubes ends got beveled to match the insert bevels, then I made two passes with the MIG torch at full power to join the inserts to the tube. I ground the welds down for a smooth appearance, but there is plenty of meat to hold things together. The rod ends are about 42" apart and I have about an inch of adjustment in either direction. Now the wheels actually turn when I turn the steering wheel. It feels good to finally get those parts done and installed. I'm sure that in a few days my original set of tie rod ends will turn up and I'll sell them on Ebay or whatever. 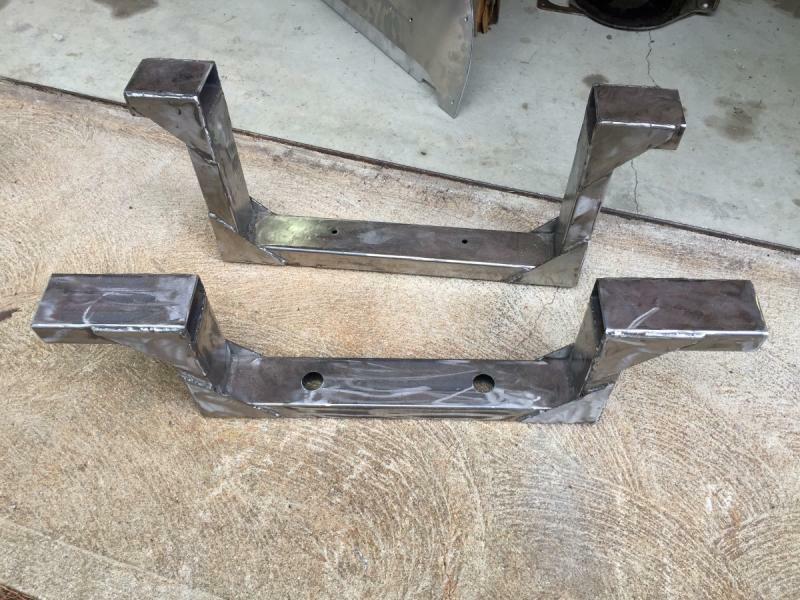 They fit Jeep Cherokee 1974-83 and Grand Wagoneer 1984-91 - as well as 1929 Studebaker President. When I had called Moog to get information on matching left- and right-hand threaded tie rods with a particular taper and thread size, they were not helpful. I think the lawyers have scared them, so that they will only tell you which ends will fit a particular recent car. Coming along, LOTS OF WORK, not a weekend project, huh?